Yes, I’m posting our Sunday Snapshot two days late, on Tuesday this week, cause, that’s how I roll at the moment – late, a bit unorganised, but we get there in the end! 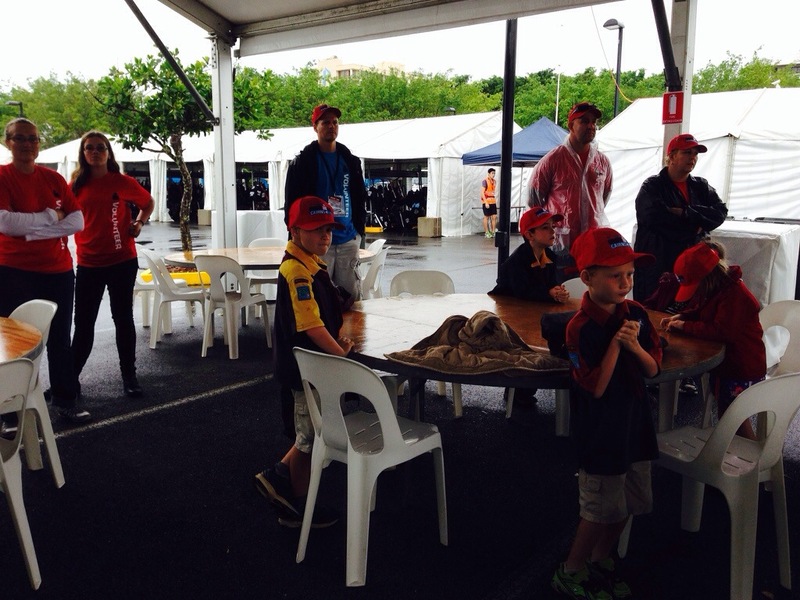 Our Sunday this week was spent volunteering at the Cairns Ironman Event with the boy’s Scout Group. We took the opportunity to spend the night before the event in Cairns, doing a bit of shopping, visiting Poppy and Rema and having a dinner out – a real treat! We were based in the ‘Personal Gear’ tent at the event, right on the finish line, which meant we were responsible for receiving all of the athletes personal belongings, hanging them up on numbered hooks and handing them over when the athlete came to collect them at the end of the race. It was a great spot to be in with lots of atmosphere and we got to see many of the high profile athletes, but it was hard work! It rained all day and we were on our feet the whole time, kept busy unloading bags and directing athletes – we didn’t even get a chance to stop for lunch! Our crew watching the big race screen while waiting for the onslaught of athletes to arrive. 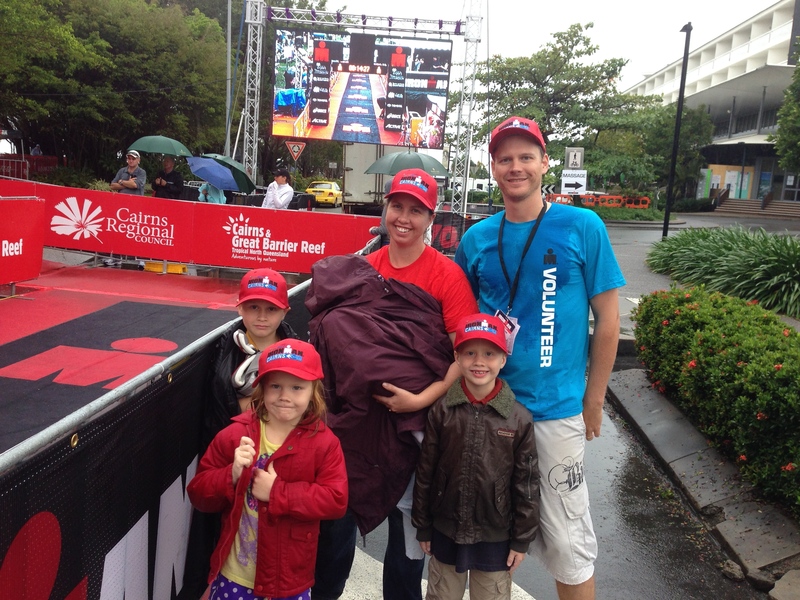 Matt and I were very proud of the kids who helped out a lot, and amused themselves out of the way in the rain as best they could, while Kipp did his best to stay happy being ‘worn’ in the baby carrier all day (yes I did have very sore shoulders by the end!). It was a great thing to do as a family. At the time we were a bit stressed, cold, wet, hungry, worried about the kids getting in the way and thinking of all the other ways we could have better spent our Sunday! But, as we walked back to the car at the end, so happy to be going home to food and hot showers, we all felt proud of ourselves! Together as a family, we had worked hard, had an adventure and an experience to remember. We got the sense of satisfaction that comes from volunteering and the kids had the pleasure of knowing they had helped their scout group and the community to stage a big event. On top of that – we got to witness some amazing elite athletes in action! 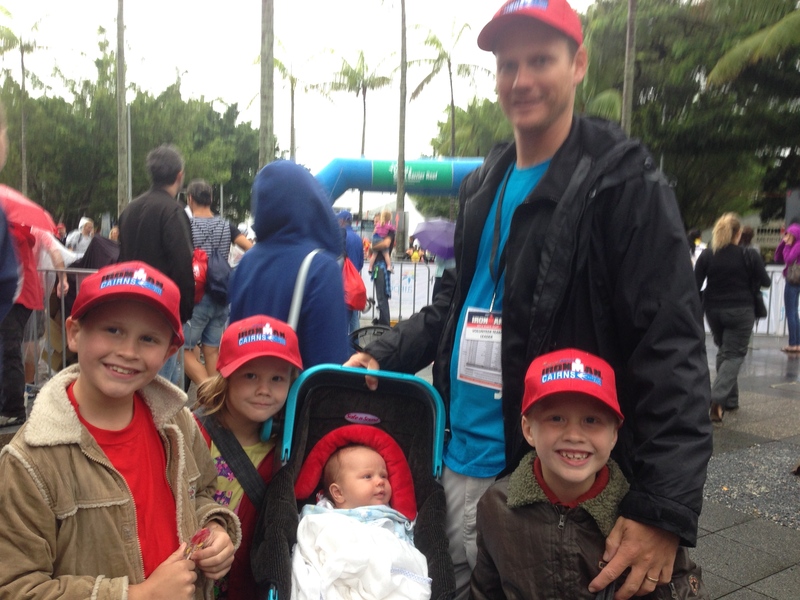 The Ironman winner, Cameron Brown, became the oldest man in history to ever win an Ironman event at the age of 42! The kids got to high five his hand as he ran down to the finish line. They got to touch a champion. Someone who sets goals, aims high, works incredibly hard for a long time and becomes a history maker!! Someone who achieved a dream, celebrated his achievement, and was gracious and humorous in his victory speech. It was pretty inspiring stuff! 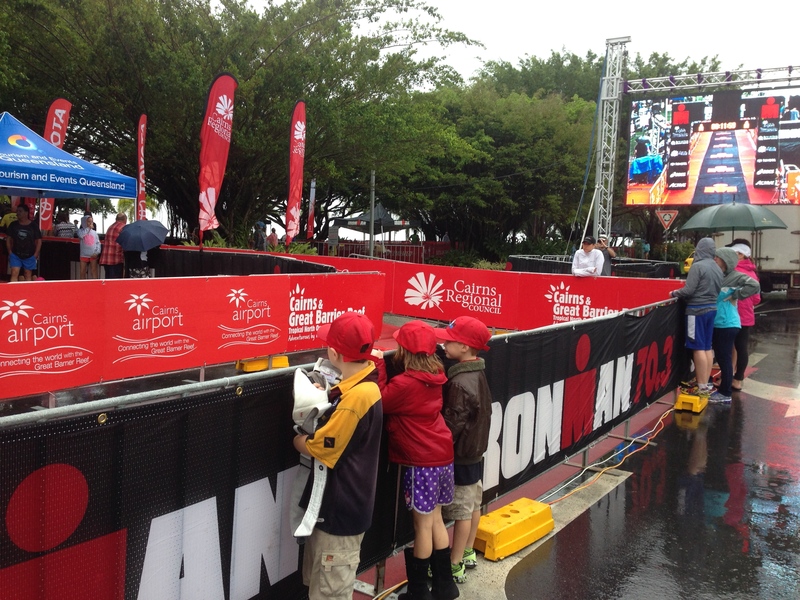 The kids at the finishing tunnel of the Ironman, cheering on the winner Cameron Brown. Now it’s got me thinking, yes about maybe having a go at a triathlon one day, but also about volunteering at some other events around the region – have you ever done any volunteering? What did you do? Did you get more than you expected out if it like we did? Oh Jess you guys are very inspiring!!! At 7 weeks (I think that is right) old! I so would not have gone anywhere near volunteering with bub strapped to me!! But it certainly looks like you guys had a great time!!! Ps some clothes for Kipp are on their way to you! My big boy just keeps on growing out of stuff!!! Carla – thanks! I don’t think we are inspiring – just a little nuts mostly!! And get lucky that things work out for the best in the end! Don’t worry – I did ask myself several times during the day if it was irresponsible volunteering with such a young bub, but the kids Scout group was desperate for enough volunteers so that they would receive some fundraising $$$$. The things you do for your kids! Some more clothes for Kipp would be fantastic as Kipp loves his tucker and is already just about in 00 stuff!! Jess I think this may be my favourite post to date. Love it, and yes very inspiring all around. May need to get my kids involved in something like that. Will need to look at some volunteering options, definitely think it is great for the kids despite the effort involved. Beck congratulations on the Half IM! Wow – I would love, love to do one eventually – I think! 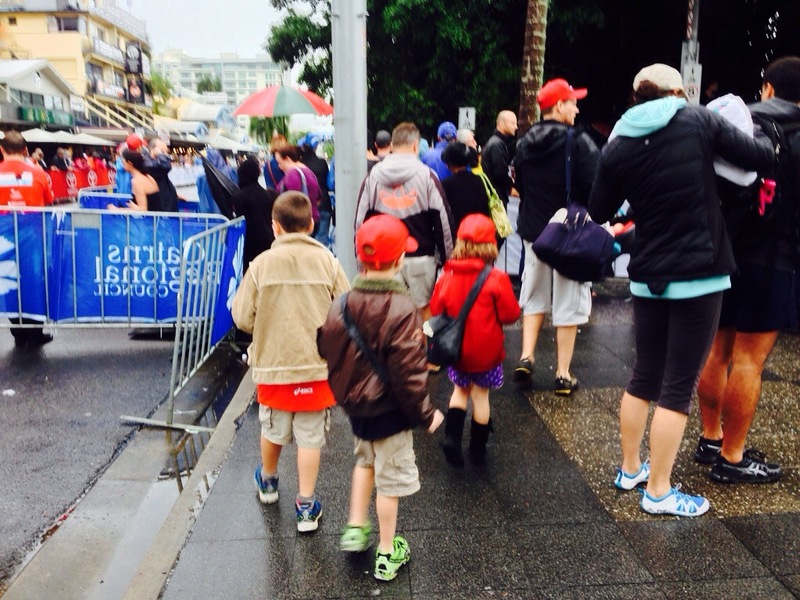 It was a pretty awful day – weather wise wasn’t it! So many of the competitors were freezing cold at the finish! I should have mentioned in my post also that is was amazing to see sooooo many people out giving the Ironman a go – that was super motivating too! !